Behind every performance captured on film, there is the backstory, the alternate footage... the B-Roll. The countless hours practicing, performing and refinement of your show. 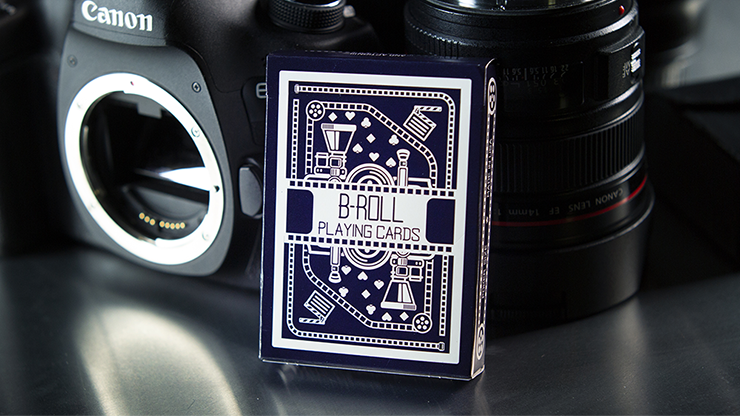 B-Roll Playing Cards is a tribute to that secret side of us all. The alternate story. The creativity. The work. A portion of the narrative on the cutting room floor. Nevertheless, everyone is enthralled as your fingers skillfully create smiles on your audience's faces. The film strip from the camera wraps around the outside of the 2-way back design. Uncover this completely customized deck including the faces, pips and court cards -- all specially designed for the B-Roll Playing Cards.